Get the spirits of Beijing with our 4 days Beijing shore excursions to the Great Wall, Forbidden City...See China’s top imperial sights, explore local Beijing life, and enjoy a walk on the Great Wall. One Tianjin Cruise Port transfer and one Beijing International Airport transfer are included. Our tour is private and can be customized. Our tour guides will be waiting at Exit 3 from 6:30am, and you will see 3–5 of them holding China Highlights boards. Your guide will lead you to your private vehicle and drive you directly to your hotel. It takes about 2½ hours to get from the port to downtown Beijing. Summer Palace with Boat Ride and the Garden of Virtue and Harmony (2 hours): The Summer Palace is the best preserved and the largest imperial garden in China, and it is one of Beijing&apos;s premier attractions. It is also possible to take a boat trip on the lake, which takes 10 minutes. You will have lunch at Chong Xue Villa Restaurant. As a part of Chong Xue Villa, the restaurant has a wonderful environment with ancient Chinese architecture and a garden. It mainly offers Cantonese cuisine. Only 10 minutes’ walk from the Summer Palace, the restaurant is a good choice for taking a break after walking around the spacious palace. Visit the Exteriors of Beijing’s Olympic Stadiums (Bird&apos;s Nest and Water Cube) (1 hour) : Located at the north end of the central axis of Beijing City, with a large area of 1,215 hectares, Beijing Olympic Park contains the National Museum of China, an exhibition area, the Olympic Village, and Olympic competition venues. Approximately 31 venues were used in the Beijing Olympics, including the National Stadium (also known as the Bird&apos;s Nest) and the National Aquatics Center (also known as the Water Cube). You will explore the park, but the trip doesn&apos;t include going inside the Bird&apos;s Nest and Water Cube. Please advise if you need walking assistance, we are happy to provide a wheelchair and walking sticks. The tour will start at approximately 8:30am after breakfast at your hotel. Tiananmen Square (40 minutes): Tian&apos;anmen Square has great cultural significance as it was the site of several key events in Chinese history. As the world&apos;s largest famous city square and the enduring symbol of China&apos;s national pride, it is surrounded by many imposing buildings including the Gate of Heavenly Peace (entry to the Forbidden City), museums, government buildings, and the Mausoleum of Mao Zedong. The Forbidden City (2½ hours): The Forbidden City was home to 24 emperors between 1368 and 1911. This "city within a city" is a World Heritage Site. It is the largest and best preserved ancient imperial architectural complex in the world, featuring a great square, halls, and gates, which stand in contrast to intricate halls, gardens, courtyards, and quarters. The exhibitions, both permanent and temporary, are all important treasures of ancient China. Dumplings and Dining in Hutong Taste Kitchen: Located in a traditional hutong, Hutong Taste Kitchen offers an opportunity to get close to the local culture and people. Your host will teach you how to make dumplings with simple ingredients and seasonings, and everybody will get involved to mix fillings, create the dough, roll the wrappers, and pinch the dumplings. You will not only learn the technique and skills, but will also hear stories about Chinese traditions. The atmosphere is friendly, relaxed, and fun, and it is perfect for a family or a group of friends or colleagues who want to have a unique experience while staying in Beijing. Lunch: Enjoy a meal you have cooked yourself. Hutong Tour in Dongcheng District: The hutongs are a maze of historic alleyways with old single story traditional courtyard houses, which are now fast disappearing. In this 1 hour tour, you can hop on a rickshaw to ride through the narrow alleys as well as visit a local family and find out about the different thresholds of the courtyards. The Temple of Heaven (1½ hours): Built in 1420 during the Ming Dynasty, the Temple of Heaven covers an area of 273 hectares. The Temple of Heaven was enrolled as a World Heritage Site by UNESCO in 1998. The Hall of Abstinence is, fittingly, a small palace. The emperor would abstain from consuming meat and wine at the palace before he held the annual ceremony to pray for a good harvest. Three days before the ceremony, the emperor would go to the palace and would not permit himself to drink, be entertained, to mourn, or to pay attention to any crimes being committed. All of these acts showed his piousness to “Heaven”. You will also get a chance to see the pictures of all the emperors who ever worshipped in the Temple of Heaven, as well as a 600-year-old copper statue of a high ranking official who supervised the fasting process of the emperor. Xin Shuang Quan Restaurant is near the Mutianyu section of the Great Wall. This garden style restaurant serves farmhouse dishes, specializing in rainbow trout. The fabulous taste will leave you with great memories. The Great Wall at Mutianyu (with Round-Trip Cable Car) (2 hours): This section is ranked as top among all the sections of the Great Wall on TripAdvisor due to its picturesque scenery, fewer tourists, and beautifully restored architecture. In order to save your time, you will use round-trip cable car rides to ascend and descend the Great Wall, instead of spending about 40 minutes climbing the steps. Your guide will be with you to hike “the most beautiful and interesting part of the Great Wall” – between the 14th and 23rd watchtowers – acknowledged by hikers as “the golden route”. The cable car and transfer bus rides to and from your vehicle are included in the price. We avoid (the worst of the) crowds on the Great Wall and traffic jams by visiting in the afternoon. It’s also the best time for taking good photos. China Highlights has set up a Refreshments Kiosk at the foot of Mutianyu’s Great Wall section. China Highlights customers will receive free drinking water, beers, and maps at the service site. Your private transfer will take about 1 hour from downtown Beijing to Beijing Capital International Airport. The collection time will depend on your flight time. Your tour guide and driver will pick you up from your hotel and drive you directly to the airport (the flight is not included in the price). We could provide you with a train station transfer instead. If you need to go to a train station, please let us know. Our tour guides, drivers and staff will arrive at Tianjin one day ahead of you to avoid fatigue driving and ensure your safety. 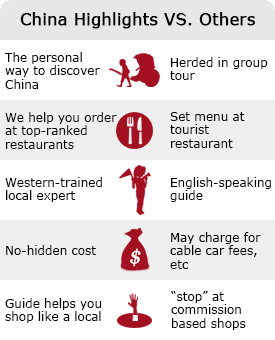 Easy to find China Highlights as all tour guides stay together with banners. During pick-up, China Highlights tour guides will stay in front of the exit and make sure you can see us immediately. Our local tour guide will introduce Beijing to you on your jounrey (about 2 hours), including background of Beijing and China, some dos and don&apos;ts on travel and night shows. Our car is licensed and registered with Beijing Tourism Administration. The driver will be familiar with the roads and routes to all destinations and restaurants, and the car will be equipped with Wi-Fi and a device that you can use throughout Beijing. Unlike some other online travel agents who sell tour products made by local travel agents, we built our own branch company in Beijing in 2010, and since then we started to make our own unique products. We aim to deliver a high-value tour to every one of our customers. We have more than 50 local staff in Beijing to solve your problems on the spot.